These Good Friday messages focus on the overarching truth of the old covenant—"without shedding of blood there is no remission" of sins (Hebrews 9:22)—as well as how Jesus' sacrificial death on the cross ushered in a new covenant between mankind and God. Good Friday Service 1993 - from our study Good Friday Messages with Skip Heitzig from Calvary Albuquerque. Good Friday Service 1995 - from our study Good Friday Messages with Skip Heitzig from Calvary Albuquerque. Good Friday Service 1996 - from our study Good Friday Messages with Skip Heitzig from Calvary Albuquerque. Good Friday Service 1997 - from our study Good Friday Messages with Skip Heitzig from Calvary Albuquerque. Good Friday Service 1998 - from our study Good Friday Messages with Skip Heitzig from Calvary Albuquerque. Good Friday Service 1999 - from our study Good Friday Messages with Skip Heitzig from Calvary Albuquerque. Good Friday Service 2000 - from our study Good Friday Messages with Skip Heitzig from Calvary Albuquerque. Good Friday Service 2001 - from our study Good Friday Messages with Skip Heitzig from Calvary Albuquerque. Good Friday Service 2002 - from our study Good Friday Messages with Skip Heitzig from Calvary Albuquerque. Good Friday Service 2003 - from our study Good Friday Messages with Skip Heitzig from Calvary Albuquerque. Good Friday Service 2006 - from our study Good Friday Messages with Skip Heitzig from Calvary Albuquerque. What does Good Friday mean to you? Is it just another Friday? Is it just a day off from school or work? For the Christian, Good Friday is the day we pause in remembrance that Jesus, the sacrificial Lamb of God, was slain for the sins of humanity. It is the time when we remember that Jesus was rejected by man and selected for sacrifice, and that He suffered unimaginable pain and torture as He was scourged and crucified. It is the day we remember that the One who was without sin became sin for each one of us. Let this Good Friday be like no other Friday in your year as you remember the price He paid for you. Sometimes bad news is good news. There's one story, for example, of a woman whose alarm failed to go off, she overslept and was late to work; bad news, right? Until you hear the rest of the story. This woman worked at the World Trade Center, and the date was September 11, 2001. Suddenly, what seemed like misfortune is recognized as a wonderful blessing. Have you ever considered what makes Good Friday so good? Let's remember the death of Jesus, and consider the new life available through His sacrifice. Fulfilled prophecy is one of the strongest evidences for the veracity of the Scriptures. Before the invention of crucifixion, Psalm 22 presents an explicit account of the execution of Christ authenticating the identity of Jesus. In this Good Friday message, we consider the anguish and the accomplishment of His death on the cross and gain a greater understanding of His love for us. Dashing the hopes of His followers, Jesus suffered and died on a cross. The disciples expected Jesus to overthrow their foes and establish His kingdom—but what good was a dead King? As we consider the death of Jesus on this Good Friday, we'll gain a deeper understanding of the enemy He destroyed that day and a clearer picture of kingdom He established. The greatest demonstration of love—true love—is Jesus, who left heaven, came to earth, went to the cross, and paid the ultimate penalty. He was buried and He rose again from the dead. He had been vulnerable—He had picked guys for His team whom He knew would deny Him, betray Him, and fail Him. Yet He loved them to the end and poured out His love anyway. As we consider what Jesus did, we learn that sacrificial love is essential in any relationship. In Psalm 22, we read an account of death and suffering like no other, but that was exactly what Christ endured on the cross for us, experiencing the separation from God that we should have. The cross points to God's great love for us, and in it we see the depth of our sin, the height of God's love, the width of our salvation, and the length God will go to bring us to Himself. The cross is the greatest demonstration of God's love, and in this Good Friday message, we go back to the day Jesus died. As we get a glimpse into the lives of those who witnessed the crucifixion, we learn how they represent different groups of people today and how those groups choose to deal with the cross. Dead air is a period of silence in radio or television in which the broadcast signal is interrupted and there's no transmission. Throughout history, God has broadcast His truth to humanity through His world and His Word—including through the person of Jesus. But when Jesus died on the cross, there was dead air. Would God ever speak again? In this message, we look at how the dead air of Good Friday would be shattered by a living Savior on Sunday morning. What's so good about Good Friday? It is the day we remember Christ's death on the cross. 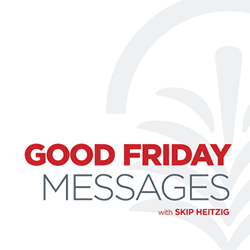 In this message, Skip Heitzig teaches that Good Friday points to a good Person, a good plan, and a good purpose. We learn that Jesus' death on the cross was the perfect substitution that saved us from our sins.